St. Louis parks have a lot to offer. From the urban grandeur of Forest Park to the quiet relaxation of Longview Farm, there's something for everyone. Here are the best parks in the St. Louis area for kids, including information on playgrounds, water features, bathrooms, and other amenities. Deer Creek Park in Maplewood is known as "Rocket Park" because its playground area is shaped like a giant rocket ship and launch pad. The playground has all the amenities kids love like slides, swings and a climbing wall. There are picnic tables and pavilions nearby for parents to sit and relax. Deer Creek Park is located at 3200 North Laclede Station Road in Maplewood. Forest Park has many great attractions for kids. 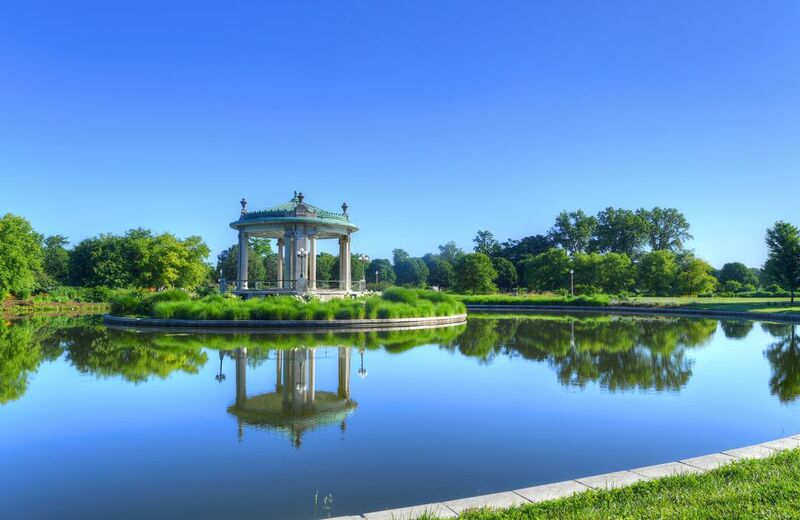 The 1,300-acre park in the heart of the city is home to the St. Louis Zoo, St. Louis Science Center, Missouri History Museum and other free attractions that are ideal for children. Forest Park also has a large playground next to the Visitor's Center and miles of trails for walking or biking. Forest Park is located just north of I-64/Highway 40 at the Hampton Avenue exit. Longview Farm is a beautiful park in West St. Louis County. It has a nice playground with picnic tables nearby. There's also a stable where children can see horses and a paved hiking trail for taking a walk. Longview Farm also has some of the cleanest, nicest restrooms of any park in the area. That's a very good thing for parents of small children. Longview Farm is located at 13525 Clayton Road in Town & Country. Another good bet in St. Louis County is Tilles Park. The park is well maintained and has an all-inclusive playground built by St. Louis Children's Hospital. Next to the playground is a water play area with more than a dozen bubblers for kids to cool off. Tilles Park is also home to Winter Wonderland, one of the area's most popular Christmas light displays. Tilles Park is located at 9551 Litzsinger Road in Ladue. Suson Park is a popular destination for families. The park is known for its working animal farm complete with horses, pigs, cows, chickens and more. There's a large playground in the middle of the park and a lake for fishing. Suson Park is located at 6073 Wells Road in South St. Louis County. It seems there's always something to do at Faust Park in St. Louis County. The park has nice playgrounds, trails, and picnic areas, but that's not all. There are also major attractions like the Thornhill Historic Site, Sophia Sachs Butterfly House, and the Faust Park Carousel. Faust Park is located at 15185 Olive Boulevard in Chesterfield. Tri-Township Park is a great spot for families in the Metro East. Tri-Township has a petting zoo (in warmer months), a skate park, playgrounds, and pavilions. There are also tennis courts, basketball courts, baseball fields, and a sand volleyball area. Tri-Township Park is located at 409 Collinsville Road in Troy, Illinois. The playground at Shaw Park in Clayton is a hit with kids of all ages. The treehouse-themed play area has multiple slides, swings and hanging bridges. There are also musical instruments for children to play, and a splash pad for cooling off on hot summer days. In addition to the playground, the park has some nice trails for relaxing walks. Shaw Park is located at 27 South Brentwood Boulevard in Clayton. Tower Grove Park in South St. Louis draws visitors from all across the area. The historic park has separate playgrounds for younger and older children. During the summer, kids and adults alike cool off at the Muckerman Fountain and wading pool. There are also free children's concerts at the Piper Palm House on Wednesday mornings in July and August. Tower Grove Park is located along Magnolia Avenue between Grand and Kingshighway in South St. Louis.